My mom bakes buns and pies almost every weekend, and this lingonberry and carrot pie is one of her staples – and super good at that! The pie crust is made from the same dough as the cinnamon buns/rolls she also makes (pulla in Finnish), which is very convenient as you can bake several pastries with the same batch of dough. The lingonberry and carrot pie is just one of the many flavors my mom bakes, other staples being apple (fresh apples or apple sauce depending on the season), blueberry, plain carrot, carrot and apple and rhubarb. The linognberry & carrot pie combines the tartness of the lingonberries with the sweetness of the carrots in an exquisite way making it very refreshing. It is also very moist and visually appealing with its super intense shades of red. Mix the yeast in lukewarm milk until completely dissolved, then add salt, egg, sugar, oil and cardamom and mix well. Add flours gradually while kneading. Continue kneading until the dough feels firm. Add more flour if the dough is too moist and sticks in your hands or in the table. Let rise until the volume is roughly doubled. Preheat the oven to 200 C (400 F). Mix the berries, shredded carrots and sugar. Check the sweetness by tasting – different batches of berries vary in sourness, so you may want to adjust the amount of sugar. The filling should be sweeter than sour/tart. Finally mix in the starch. Roll the dough when it has risen to fill a baking sheet. With your finger, press around the edges to create a “rim” to keep the fillings inside the crust. Spread the lingonberry-carrot filling over the crust. Optionally brush some egg over the crust edges to give it a beautiful glaze. Bake for 17-20 minutes until the edges have nicely browned. Mmm – I thought that cakes are off the menu, Antti?? Your pie looks gorgeus though – I love pullataikina-based cakes. 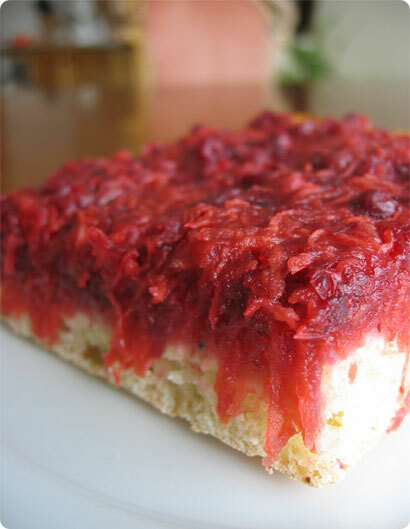 Have never combined lingonberries and carrots in a same cake, but the tart-sweet combination should be perfect indeed. Unohdit ?idin piirakoista mun lempparin – rusinaisen rahkapiirakan. There is no doubt in my mind that the best baking is always done by our mothers. What a beautiful treat! Carrots with lingonberry: wow. And I never thought of using pulla as a crust just in the thousand ways to roll/braid/pull/twist etc … hmmm … where is my drawing of all the ways to do pullla? No lingonberries here either so I’ll have to adapt for lingonberry preserves. Alanna, I think you can substitute the lingonberries with cranberries – as an ex Massachusetts resident Cape Cod and its cranberries are close to my heart :) I think any red tart berry would work fine, e.g. currants.